After years in development, back in 2013 Dave Forrest finally realised a personal ambition and was very pleased to offer magicians worldwide the most organic chop cup in existence! A beautiful, professionally made leather-bound chop cup complete with TWO perfectly balanced magnetic dice (they always land six side up!) 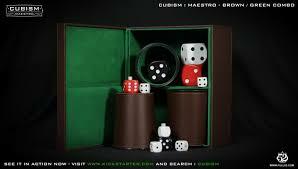 plus the 'blank', the 'mini', two 'fairs' and all load dice! Needless to say, this was an immediate success and and instant sell out! As proud as Dave was of 'Cubism', He wasn't completely satisfied with it on a personal level. That's because, during the several years it took to get 'Cubism' to market, it had occurred to him that, in fact, rather than simply being a single chop-cup, the 'dice/dice cup' combo could (should!) actually be expanded into a full 'three cup set' ala 'cups n' balls'. And so, we arrive at the all new 'Cubism Maestro'. 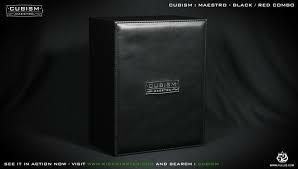 This Super Deluxe Edition includes the original 'Cubism' plus two, regular dice cups - black (or Brown) leather exterior with a red (or Green) felt interior - identical to the 'Cubism' chop cup. You also receive two more medium loads - one white and one red. Two more jumbo loads - One black and one white. And, two more regular white dice. All in stunning, embossed, custom made case. This really is superb quality and a must for any serious close up worker and collectors alike. 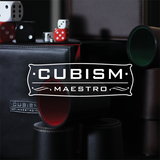 The Cubism Maestro set will make for one of the most visually striking and off-beat 'cups and balls' routines ever. There is a free download instruction for the ‘Cubism’ available, and the ‘Cubism Maestro’ can be performed with any classic cups and balls routine (not supplied).